Fixed odds betting terminals (FOBTs) are installed in many bookmakers throughout Britain and they allow gamblers to bet up to £100 every 20 seconds. Bookmakers can have four of these machines in each shop and, as you would imagine, they are highly profitable. However, there is much concern about FOBTs among gambling charities as these are considered a major cause in the rising numbers of gambling addicts in Britain. Take Tony Franklin, for example. Mr Franklin admitted to spending £3,500 on these betting machines in under an hour just before Christmas. His addiction to gambling led to him spending every penny he had on betting machines. Franklin had saved up the money over a period of months during which he was ‘clean’. However, in just 59 minutes, he managed to lose it all on these fixed odds betting terminals and the money, which had been earmarked for debts and Christmas presents, was gone. Franklin admits that this is not the first time that gambling has ruined his life. He has been successful throughout his life in business and, as a sales representative, made quite a bit of money on commission; his biggest monthly commission pay cheque being £13,000. However, he estimates that he has squandered approximately £1 million on gambling over a period of twenty years. Franklin’s urge to gamble led to him trying to make money through a series of scams, which began with him bouncing cheques. He then moved on to running up debts of thousands and tells of how during the late nineties, he had no job but still had £100,000 worth of credit. In addition, he also admits to making thousands of pounds every month by purchasing mobile phone contracts. He would then pay the monthly charge but would sell the handset. Every penny that he made from the scams was spent on fuelling his gambling addiction. For years, there has been a certain stigma attached to gambling addiction but it is now recognised as an illness. Moreover, with around 35,000, FOBTs in Britain, the problem is going to get worse. Research has revealed that problem gambling occurs in about 0.4% of all UK adults. However, for those who use these betting machines that figure rises to 23%. On Merseyside, public health authorities were so worried about fixed odds betting terminals that, in April 2014, they recommended bookmakers be able to track peoples’ use by requiring those who used them to become ‘members’. A survey revealed that those using FOBTs admitted to losing money as well as time away from their families and that resulted in arguments and mistrust. The report also found that problem gamblers would often have anxiety, which, in turn, leads to insomnia, and that the gambling addiction can have a ‘ripple’ effect which impacts on others. Families of gambling addicts often suffer with depression and anxiety. When things got so bad, Franklin left the UK and headed to Eastern Europe where he was ‘clean’ for seven months. However, he then suffered a relapse and lost £100,000. Franklin is among many British people who have been gambling for years on every type of electronic betting imaginable but even he is concerned about the growing number of FOBTs. He feels that these machines should not be so prevalent in society, especially as roulette is such an addictive game. He also feels it is the responsibility of the bookmaker to identify problem gamblers and then exclude them from betting. How is the Industry Helping? The gambling industry is aware of the concern regarding FOBTs and now says that steps have been put in place requiring staff to intervene to prevent big losses from occurring and to limit the amount of time that gamblers are spending on these machines. However, Franklin disagrees. He said that during his latest gambling spree, he lost thousands of pounds but nobody stopped him from betting. Campaigners are now calling for the stakes to be dramatically reduced on FOBTs. They want the limit dropped from £100 per spin to £2 per spin and it appears as though the campaign is gathering momentum, with a quarter of all English authorities behind the proposals. Bookmakers are obviously against the proposals and are trying to convince the government that they can deal with the problems themselves but, so far, this has not been successful. The government needs to intervene to reduce the stakes to prevent more and more people from developing gambling addictions. A gambling addiction can have a devastating effect on the addict as well as their family members. As in the case of Tony Franklin, every penny that he had saved to pay for debts and for his family’s Christmas presents was lost in a moment of madness where he admits to losing control. 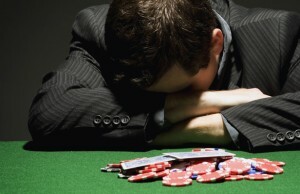 Gambling is a compulsive disorder and those who suffer with it need help as soon as possible. At Addiction Helpline, we know that gambling is an illness and that those suffering with it need to get help sooner rather than later. We are a rehabilitation referral service and can put you in touch with the most suitable centre for your needs. Our experts will offer free, confidential advice to those suffering with addiction and will make sure that you get the help you deserve. Call us today.